Place the eucalyptus into hot olive oil and let it sit for about 45 minutes, stirring occasionally. Strain the leaves and branches out with a mesh strainer and reserve the oil. Be sure to press on the leaves and branches to harvest as much oil and flavor as possible. In a food processor, blend the cheese, garlic, spinach, and walnuts. Slowly add in the oil while the machine is running. Cook the pasta. When it is ready, strain, reserving about a half cup of the pasta water. Immediately mix the pasta and water with the pesto. Sear the scallops on both sides. 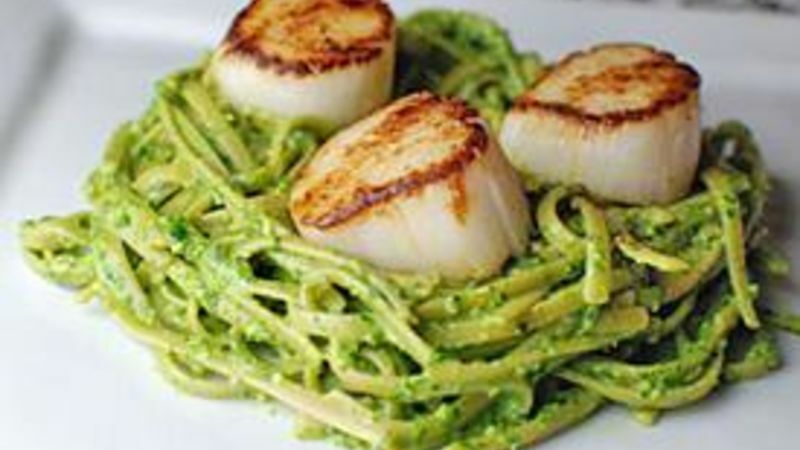 Put the pasta on a plate to serve and top with scallops.